Guide to the London stage musical "Phantom of the Opera "
This page is a brief guide to the stage musical Phantom of the Opera, which had its world premiere at Her Majesty's Theatre in London's West End in October 1986. It is currently being staged at the same theatre, as well as at several other theatres across the world. A sequel to the Phantom of the Opera is currently under development. Andrew Lloyd-Webber announced in September 2008 that the title will be Love Never Dies. The story is set in Coney Island (New York City) about 10 years after the beginning of the original story. It will be performed at the Adelphi Theatre starting in October or November 2009. Tickets will go on sale at the end of May 2009. 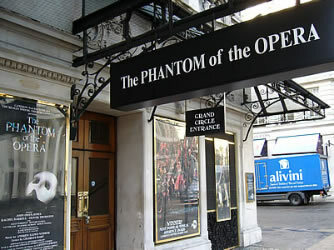 Phantom of the Opera will continue to be performed at Her Majesty's Theatre. 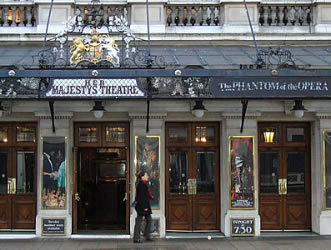 Her Majesty's Theatre is at 57 Haymarket, London SW1Y 4QL (nearest Tube: Piccadilly Circus or Charing Cross). It is at the junction of Haymarket (the A4) and Charles II Street. The performance lasts about 2 hours 30 minutes (including a 20 minute interval). Christine Daaé, a young chorus girl (dancer and singer) at the "Opéra Populaire". She is the daughter of a talented Swedish violin player. Her father died when she was 7 and her mother was already dead, so she became an orphan. She now lives in the opera house, looked after by Madame Giry. 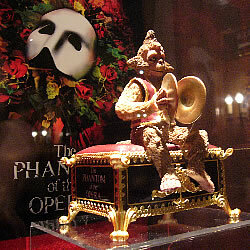 The Phantom, a masked man who haunts the theatre, also known as the Opéra Ghost or "O.G." He sends notes to the managers to demand money, and insists that box 5 in the opera house is kept free for him during performances. Raoul, whose official title is Vicomte de Chagny. He is the new rich patron (financial supporter) of the opera. He used to play with Christine when she was younger. You may find it helpful to know the outline of the story before seeing the musical. The main character is a young woman called Christine. Her father was a great Swedish violinist who died when she was a young child. Before he died he promised her that he would send her the "Angel of Music". She is now living in the opera house, working as a ballet dancer. She is looked after by the ballet mistress Madame Giry, and her best friend is her daughter Meg. Christine has been taught to sing beautifully by a secret tutor. We learn that her teacher was a voice which calls to her when she is alone in her room: she thinks this is the Angel of Music sent to her by her dead father. There are two new owners of the opera house. Madame Giry tells them about the phantom. The Phantom expects them to pay him money each month, to leave one of the opera boxes empty for him, and to follow the instructions which he leaves in letters. However, the managers ignore the Phantom's requests. It is the first night of a new production based on the story of Hannibal. The leading lady is upset because a series of "accidents" and she walks out. Madame Giry suggests that Christine could take her place. Her voice is so good that the managers agree to let her perform that night. Raoul is the patron (financial supporter) of the opera house. He watches the performance from one of the opera boxes, and recognises Christine because they he used to play with her when they were children. He is attracted to her beauty and lovely voice, and goes to visit her backstage after the show. When Christine is alone in her room, the phantom's face appears in her mirror. He wears a mask over part of his face. He leads her through the mirror and down a series of passageways to his secret home on an underground lake beneath the opera house. 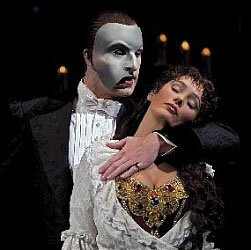 The Phantom is a composer who has been inspired by Christine and is training her to sing his music. He is obsessed with her, but he knows that she won't love him because of his horrible face. She faints and wakes the next morning to the sound of his musical box. She is curious to see the Phantom's face and angers him by taking off his mask. The Phantom allows her to return to the world above. Buquet (a stagehand) sees the Phantom returning with Christine. Madame Giry warns him to say nothing, but he ignores her advice. The Phantom demands that Christine is cast as the leading lady in the opera Il Muto, but instead she is given a silent role and Carlotta is made the leading lady. The Phantom finds a way to ruin Carlotta's voice, forcing the managers to replace her with Christine. 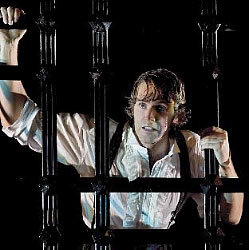 Buquet is killed, and in the chaos which follows Raoul takes Christine to the roof for safety (while the performance continues). They state their love for each other, watched secretly by the Phantom. 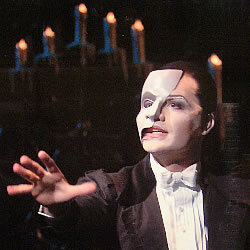 The Phantom is jealous of Raoul and is angry with Christine. The theatre organises a large masquerade (masked ball) to celebrate the New Year. Christine is engaged to Raoul, but has asked him to keep it secret. The Phantom has not appeared for six months. However, he turns up at the ball and orders that they perform an opera he has written called "Don Juan Triumphant". Raoul asks Madame Giry about the Phantom. The Phantom was born with a disfigurement to his face and his mother forced him to wear a mask before selling him to a travelling fair which kept him in a cage and showed him off as part of a freak show. He escaped, and Madame Giry helped him to find a hiding place in the tunnels underneath the opera house. She was the only one who knew this secret. Christine goes to the cemetery where her father is buried. She thinks she will be able to break the power of the Phantom over her if she can get over her sadness about her father's death. 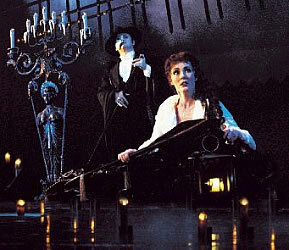 The Phantom is there and starts to draw her into his power, but Raoul appears and takes Christine away. The Phantom promises to take revenge on both of them. There are also some Italian words / phrases in the musical, such as: Signora (Madam); Signor (Mister); Roma (Rome); Andiamo! (let's go! ); Brava! (the female version of bravo, which means "great! "); bravissima (the greatest! ); Padre mio! (My Lord! ); (Gran) Dio! (God! ); prima donna (first lady); Addio! (goodbye! ); Il Muto (the silent man); Maestro (Master); Che imbroglio! (what a cheat! ); più non posso! (I can't do it any more!). Many Italian words connected with music or the opera are used in English as well, including tenor, soprano, diva and aria. The start of the musical is in Paris in about 1910. By this time electric lighting has been introduced, and cars are being used on the roads. The main story is set in Paris in 1870, a peaceful and prosperous time in France, just before the start of the Franco-Prussian war. Gas lighting was still being used at that time, and horses and carriages are being used for transport. 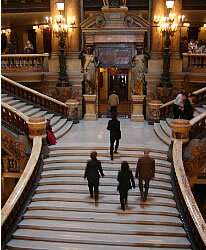 The story takes place in the "Opera Populaire". This is not a real place, but is clearly based on the Paris Opera House (also known as the Opera Garnier), the largest opera theatre in the world. The author Gaston Leroux visited the Opera House while it was under construction (it was built between 1857 and 1874). 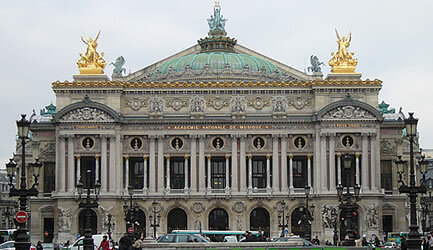 The Paris Opera House is built above an underground river that leads to a lake. This provided the inspiration for the phantom's hiding place. 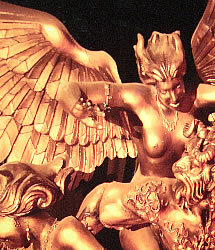 The first opera in the story is based on the story of Hannibal. Hannibal was a military leader for Carthage (now Tunisia) in Iberia (now Spain). In the Second Punic War (218-203 BC) he marched from Spain across South France into northern Italy, crossing the mountains (the Pyrenees and the Alps) with an army which included elephants. Although he was a great general and won some victories over the Romans, he was unable to capture Rome. English: If you are not a native English speaker you may find it difficult to hear all of the the words of the songs. You may find it helpful to read the story outline above and to check the vocabulary, as this will help you to follow the story..
Age: Adults will enjoy this production. It is quite a dark story and is not recommended for those under 14. Music: There is music throughout the performance. You do not need to be like operas to enjoy this musical - a variety of styles of music are performed. 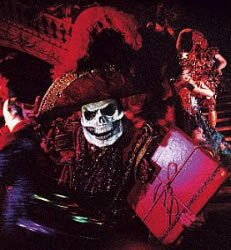 The music of Phantom of the Opera was composed by Andrew Lloyd-Webber. He has written the music for many other popular shows, including Joseph and the Amazing Technicolor Dreamcoat, Evita and Cats.